Since its creation, the YEAR Network has intensively worked to support the career of young researchers from our member institutions by promoting the development of their professional skills and facilitating the international cooperation and exchange of knowledge among them. With this purpose in mind, the network also bridges the generation gap between researchers in Europe; fosters excellence in industrial research and technology; and gives voice to young researchers at European Commission level regarding policies that directly affect them. successful annual conference, workshops and webinars will be organized as well as new interesting proposals. Additionally, a team within the board will be in charge of boosting our external relations with two main objectives in mind. 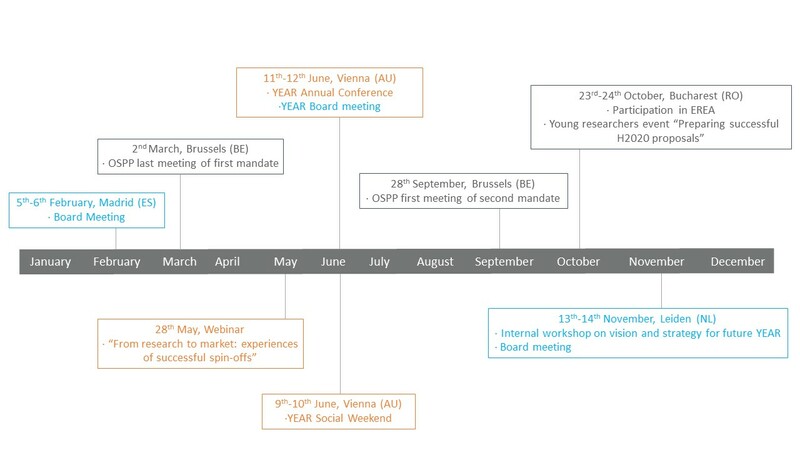 On the one hand, to reinforce the collaboration with other young researchers networks and maintain the collaboration with European Commission level giving voice to young researchers and, on the other hand, to enhance the network visibility and bring new members. Finally, internal management has been addressed in terms of efficiency and network sustainability. workshop and making this event unique. Also a webinar on experiences in the creation of successful spin‐offs gave our young researchers an insight in other ways of knowledge transfer, specifically, in the challenges that the creation of an innovative company entails. At consultancy level, YEAR network remains part of the Open Science Policy Platform (OSPP) that has extended its mandate until 2020. Our role here is particularly notable as YEAR Network is the only young researchers network that has representation in the platform.